Removing these chemicals from the Pond water is vital to allow the fish to live. 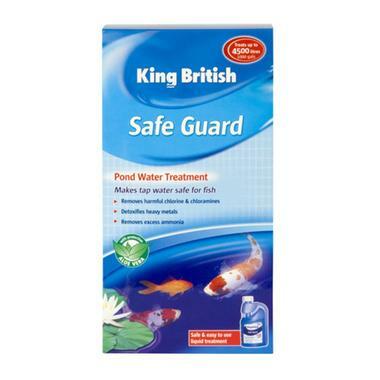 The Safe Guard treatment makes this water safe for fish by removing these chemicals as it is added to the water. Safe Guard also coats the fish with a natural barrier of Aloe Vera which can help sooth damaged tissue. The treatment is safe and easy to use. Simply calculate the dose needed by following the enclosed instructions, dilute in a bucket or watering can and pour around the pond water.